Immediately after watching the game, I reflected on some of the great offensive and defensive plays during the game, which led to the team's biggest upset win since Super Bowl XXXVI. However, after watching the game a second time it struck me how badly the Patriots dominated the Cardinals in the third phase of the game. Mike Reiss from ESPN Boston calculated about 53 yards of hidden yardage due to their special teams play. This advantage definitely aided the effort but the way in which the team used its kicking game to compliment the other two phases helped control the tempo of the game and kept the Cardinals in a chase mode for most of the game. Ultimately, this edge was enough since the game was decided by a few mere feet, wide left. Since the Patriots played off the ball with deep safeties almost the whole game, they just gave up three plays of 25 yards or more. One of those plays was the David Johnson 45 yard run, which combined poor Patriot tackling and a Barry-Sanders-like-spin move in the backfield. Besides their possessions following the two Patriot turnovers (one with a short field) and the second to last drive of the game (which resulted in a TD), the Cardinals struggled to move the ball the length of the field. The stats tell the story as Arizona only scored once on any drive longer than 54 yards. Although their average gain per play was 5.8 yards, that was considerably down from their average of 8.5 yards last season when they had the best vertical passing game in the league. On two different occasions, the Patriots scored and then on the next play executed a great kickoff to pin the Cardinals deep in their own end. After Garoppolo audibled to connect with Chris Hogan for a 37-yard strike in the first quarter, Stephen Gostkowski pooched the ensuing kickoff to about the Cardinals 5 yard line, where returner Andre Ellington was met by a wall of four Patriot defenders; Nate Ebner, Matt Slater, Brandon Bolden, and Jordan Richards. All four pursuers used their speed and technique to fight off blocks and to meet Ellington together in a near-perfect line at the 11-yard line. The TD followed by an outstanding kickoff had to make the Cardinals feel like they were in for a long game. Much later in the game, the Patriots again played great complimentary football. After Gostkowski put the Patriots ahead for good, 23-21, after he nailed a 32-yarder, the Patriots executed a nearly identical kickoff. This time Bolden, Ebner, Patrick Chung, and Barkevious Mingo again arrived quickly and in linear formation, giving Ellington nowhere to go, as he was gang tackled at the 8. The kickoff team's outstanding coverage made the Cardinals drive a long field just to get onto the borderline of kicker Chandler Catanzaro's range. It turns out that the 63 yards they gained wasn't enough after a poor snap led to a hooked 46 yarder ended the game for the Cardinals. It was noted during the telecast that Catanzaro was 1-4 from beyond that range last season so you can be sure the Patriots coaching staff knew this when they played the last drive pretty conservatively on defense to make their opponent earn their yards while keeping the safeties deep enough to defend the deep ball. 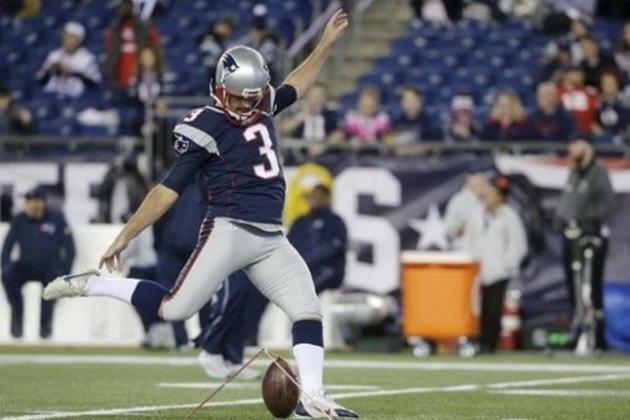 The Patriots also used their kicker as a weapon when the momentum seemingly turned against them due to turnovers. When the Patriots fumbled in the second quarter, after Garoppolo fumbled after a strip sack by linebacker Markus Golden, the Cardinals defense was energized by the change in momentum. They forced two punts to end the half after the Patriots lost 8-yards COMBINED on the drives. Later in the game, the team was presented with a similar predicament. After LeGarrette Blount bullied his way for an 8-yard TD (note: I'm not sure how you can call Tyrann Mathieu a top safety in the league when he doesn't know how to tackle properly), the Patriots again gave the Cardinals defense a shot of adrenaline after Blount fumbled on the ensuing possession. The Cardinals offense wasted no time in cutting the lead to 17-14 after Johnson ran it in from the 1-yard line, thereby increasing the pressure on the Patriots offense. New England's offense had a few shorts runs and Jimmy G dinked and dunked as the team slowly moved the ball forward, but the drive stalled at the Arizona 35 yard line. Belichick didn't hesitate sending out his Pro Bowl kicker, who split the uprights with a 53 yarder that could've gone 65. As noted earlier, Bruce Arians didn't have such a weapon at his disposal in a key situation, which of course was a major difference in the game. It should be noted that in the first quarter, Meat also nailed a kick from the same distance from which his opposing colleague choked at the end, which was mere icing on the cake for his fantastic day, leading to his award for AFC Special Teams Player of the Week. Until Tom Brady, Rob Gronkowski, Nate Solder, Dion Lewis, and (maybe) Sebastian Vollmer return, the offense will struggle to keep up with teams that can score a lot of points. In the meantime, the team can count on their special teams to make the clutch kicks and negate opponent returns in order to assist the other two phases. This has been an underrated part of the Patriots' success in the past 15 years, but should never be underappreciated as a key component to their overall success.